Dorry has just left her small town, the only home she's ever known, and moved to the big city because her father was laid off at his factory. She is completely alone. No one seems to acknowledge her existence at her new high school, and she is readily ignored and even insulted when she tries to approach other teens. No one bothers to get to know her, except for a tight knit group of kids who call themselves "Fishers." They invite her to sit with them at lunch, and then proceed to invite her to their church activities. They shower her in love and acceptance and call her "friend." Dorry is so happy to have some friends, so she doesn't mind that they are a little odd. She tries to not feel uncomfortable when they pray over their food at school, and how they constantly talk about religion and God. 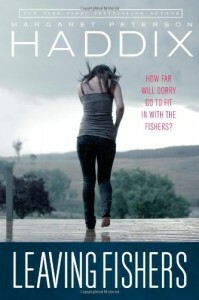 Eventually Dorry finds herself at a Fishers retreat, where, she is unwittingly "willingly" baptized. Being a Fisher, she suddenly has to accomplish a number of tasks, follow rules, and she feels guilty if she can't live up to the Fishers' expectations. She starts to alienate her family, her grades flounder, and she has to consider the cost of what pleasing the Fishers and God really means. This book does an excellent job at portraying an insecure teenager's probable reaction to acceptance, and in this instance, an acceptance of a cult. I've studied a little about cult psychology, and I could see it in this group, portrayed by Haddix, quite well. The groupthink, the guilt, the love bombing are all there. It hit a little close to home with me. Especially the part where Dorry goes to the Fishers retreat. Some of the scenes remind me of my own personal experiences attending religious camps as a youth. Particularly the hyper emotional campfire testimonies and discussions and the guilt associated with saying "yes" and "no" to certain religious questions and activities. There is also a part where her love interest basically tells her that he will only date fellow Fishers (a very manipulative scene after Dorry leaves), and I know so many that join a religion just to be able to date or be with someone who won't accept them for who they are. Overall, I'd recommend it to those interested in cult acceptance and recruitment and groupthink. I wish the book touched a little more on moving on after leaving Fishers, as I think that the process of leaving can be rather difficult, and I feel like that part of the book was a little rushed.